These and other findings are the result of a February 2011 study conducted by Bay Street Group. Managing partners, partners, senior executives and senior staff from Top 100 accounting firms participated in the survey, which shows that the best-managed, most successful firms are aggressively adopting Cloud, SaaS and document management solutions. The survey results show that firms are adopting these technologies in order to become more competitive, provider better client service, and improve client retention. 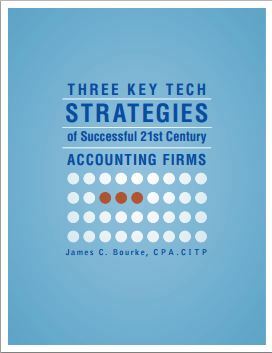 “The results of this study are generally very good news for the accounting profession, and also point to huge opportunities for small- and medium-size firms to improve client service, and add to their own bottom lines by mirroring the technology practices of the Top 100 firms,” said Jim Bourke, CPA CITP, Partner at Withum Smith+Brown, PC.